Eden’s Bounty Garden brings together parishioners, preschool families, community members and businesses, to support those who visit Under One Roof Food Pantry. Planning began early in 2017, and by mid summer we were growing fresh and healthy produce using the Back to Eden garden concept that recreates nature’s intended growing environment. 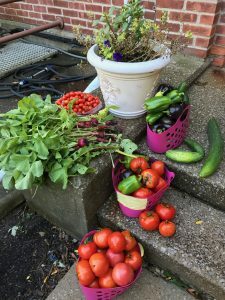 Sizeable yields of tomatoes, green beans, cucumbers and cabbage were bagged and given to the food pantry that is located at St. Paul’s and supported by Maumee Churches United. Greens, squash, herbs and radishes were also provided. Pantry clients were thrilled to receive wholesome and healthy fresh vegetables along with their other groceries.